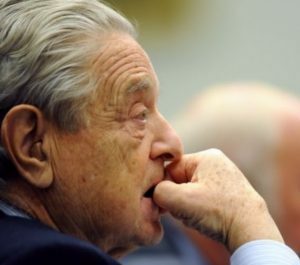 Soros likely saw his ties with the CIA coming to an end when, on the eve of Trump’s inauguration, the hedge fund mogul lashed out at Trump as a “conman, an imposter, and a would-be dictator.” Soros was speaking at the annual World Economic Forum in Davos, Switzerland. Soros contributed $25 million to Hillary Clinton’s unsuccessful presidential campaign. In addition, Trump’s win, and the resultant stock market rally cost Soros, a known stock market and currency speculator, around $1 billion in losses. The severance of links between the CIA and Soros’s OSI, the Open Society Foundation, and other NGOs in eastern and central Europe. This region has been a hotbed of U.S. “soft power” projection directed against nationalist and pro-Russian parties with the assistance of U.S.-funded broadcasters like Radio Free Europe and Radio Liberty and the Voice of America, acting in concert with Soros-financed social media campaigns conducted using Facebook, Twitter, YouTube, podcasts, mobile phone instant messaging, on-line chats, Android and I-Phone applications, and micro-blogs. Radio Free Europe and Radio Liberty are vestiges of the Cold War created by the CIA and re-purposed after the fall of Communism to extend American and NATO influence over nations extending from Poland and the Czech Republic to Uzbekistan and Kyrgyzstan. Soros’s OSI took over the archives of Radio Free Europe from the CIA and moved them from Munich to Prague. A number of political leaders in eastern Europe and Eurasia, including the prime ministers of Hungary and Slovakia and the presidents of the Czech Republic, Serbia, and Macedonia, have complained about the coordination of activities on their soil between the CIA, Soros, and domestic opposition groups. It was this sort of coordination that led to anti-democratic “colour revolutions” in Georgia, Ukraine, Kyrgyzstan, and Macedonia that led to the ouster of democratically-elected governments. In a more “cloak-and-dagger” move, the CIA, which has closely monitored groups acting against the activities of Soros and warned them of threats when necessary, has dropped that surveillance, according to our sources. That means Soros and his minions of “Sorosites” are now fair game for intelligence agencies ranging from Budapest, Podgorica, and Bucharest to Chisinau, Minsk, and Skopje. George Soros may now have to make one more “investment” — the hiring of capable personal body guards.